Every year Buddsteel Architectural Products Ltd. gives away hundreds of seedlings to school students in honour of Earth Day. As well as helping our environment, Alf Grubb at Buddsteel enjoys spurring the innovation our local schools exhibit in the planting and distribution of the evergreens. 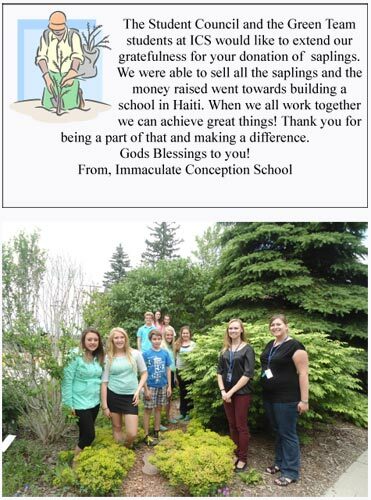 Immaculate Conception School in Formosa took up Alf’s challenge this year in a new and exciting manner! Using the donated trees as a fundraiser, Immaculate Conception’s ‘Green Team’ were able to raise money to help fund a new school in Haiti! What a win-win situation for our local environment and children in Haiti! As the Green Team says “When we all work together we can achieve great things! Thank you (Buddsteel) for being a part of that and making a difference”. Thank YOU Immaculate Conception Green Team for reminding us all what we can achieve when we work together for our environment and fellow man!